“No matter how sophisticated you may be, a large granite mountain cannot be denied – it speaks in silence to the very core of your being.” – Ansel Adams (1902-1984). 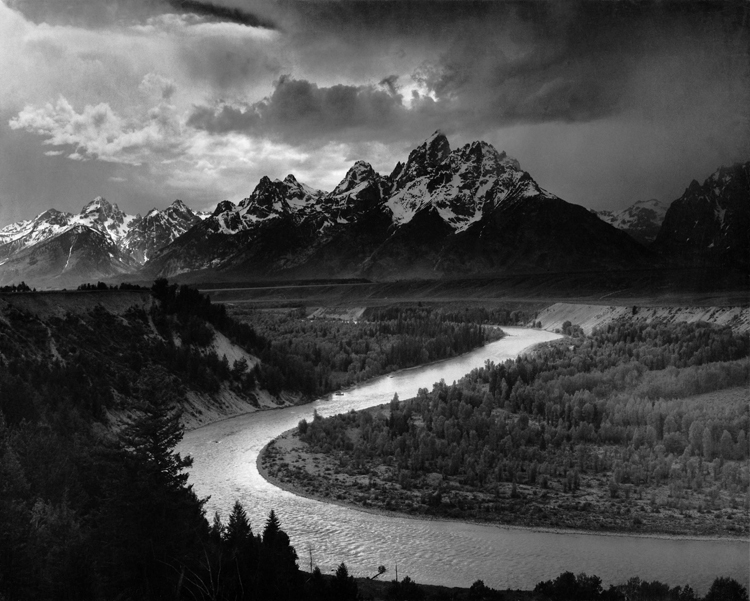 Ansel Adams, American photographer and environmentalist, is one of the best known photographers in the history of art. His black and white, large-format landscape photographs are full of luminosity and space. His respect for the land permeates his work – he aimed to see beneath the surface and to record its essential qualities, most often taking inspiration from the Yosemite Valley where he lived and breathed and worked. His position in the history of art is undeniable. Indeed, he is credited for his contribution to the recognition of photography as an art form. Countless reproductions of his images are available on cards and calendars. But nothing compares to seeing his work in person, and his photographs have sold at auction for more than $700,000 in some cases. However, under the right circumstances, it is possible to buy a high-quality piece for significantly less. At a Christie’s auction in April this year, for example, his photographs sold at a range of prices, from $10,000 to $545,000 each. So auctions can offer good opportunities for buyers, although with many now operating online, the element of luck has been reduced. To increase your chances of landing a good investment, do your research and look at the information available ahead of time, such as sale prices achieved previously, and a list of the works currently available at public auction – this data can be found on a number of art-price information websites. Remember too that physical galleries will often accept an offer on the list price. But what if you’re looking for less-established, more affordable artists who might have the staying power to follow in Adams’ footsteps? Today there is a young artist whose work might qualify. David Wightman is an English painter known for his abstract and landscape paintings, which he makes using collaged wallpaper. Wightman has been profoundly inspired by Adams’ work: “I first saw Ansel Adams’ work in a dusty monograph at Stockport College library when I was 16 years old. I think I was amazed at how timeless his photographs seemed. A few years later I started experimenting with landscape ideas in my painting. Adams was a huge influence in my pursuit of landscape as a serious artistic endeavour. 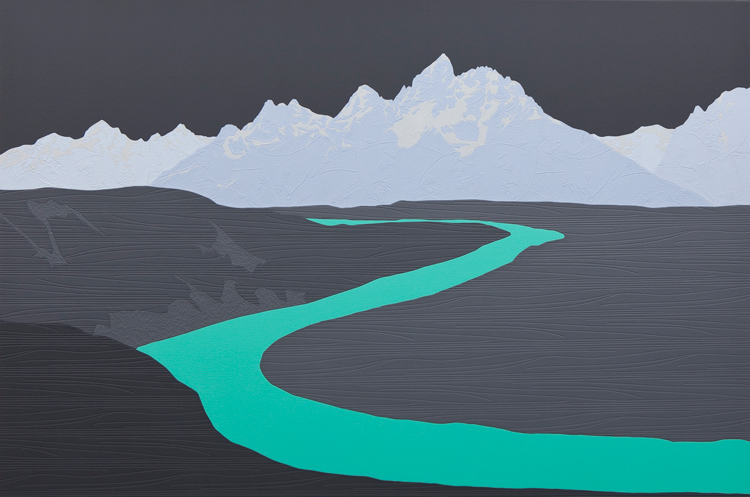 It was only with Teton, however, that I decided to acknowledge his work so directly.” The painting pays homage to Adams’ The Tetons and the Snake River photograph [below]. His use of media and technique are evidently different. However, the characteristic clarity and precision of Adams’ approach to photography is apparent too in Wightman’s paintings. His technique is unique – Wightman painstakingly constructs the picture plane from vintage wallpaper which he then paints. While both artists have a contrasting aesthetic and style, they share an intricate and time-consuming process that is not immediately apparent. Wightman graduated a decade ago from his MA at the Royal College of Art (RCA). At just 23 years of age, he was the youngest graduate at the time. During his time at the RCA, he won the Young Artist of the Year prize and since graduation has become much sought after. Until recently Wightman was represented by Halcyon Gallery, but due to increased private sales, his recent collaboration with the international fashion house Akris, and many public commissions, he decided to represent himself. With solo shows planned with Long & Ryle for 2016, along with many other group and public exhibitions, Wightman’s work is set to increase in value steadily over the coming years. For instance, Teton is now worth five times the amount it could have been bought for five years ago. Fortunately, Wightman’s work is still accessible for budding investors: a small piece (50 x 75 cm) can be picked up for around £2,000, with larger pieces ranging from £3,000 to £15,000.